Precious metals futures on Monday ended lower for a second consecutive session as the U.S. dollar recovered some from recent declines. Metal losses ranged from 0.2% for palladium to 1.8% for silver. Gold for February delivery fell $11.80, or 0.9%, to settle at $1,340.30 an ounce on the Comex division of the New York Mercantile Exchange. "From a technical perspective, inability of gold to break past $1,370 also resulted in profit taking," MarketWatch quoted Chintan Karnani, chief market analyst at Insignia Consultants. "Gold needs to trade over $1,333.50 after the FOMC meeting and nonfarm payrolls on Friday to prevent a crash." Gold futures traded from a low of $1,336.10 to a high of $1,351.40. They climbed 1.4% last week for their sixth weekly increase in seven weeks. On Thursday, they ended at $1,367.40 an ounce for their best settlement since Aug. 4, 2016. Silver for March delivery lost 31.4 cents to finish at $17.127 an ounce. Silver futures ranged from $17.08 to $17.47. They jumped 2.4% last week. While also falling on Friday, on Thursday they settled at $17.615 an ounce for their highest close since Sept. 15, 2017. April platinum fell $5.70, or 0.6%, to $1,012.70 an ounce, trading between $1,010.50 and $1,017.40. Palladium for March delivery dipped $1.65, or 0.2%, to $1,083.40 an ounce, ranging from $1,077 to $1,088.85. Both metals declined last week — platinum by 0.2% and palladium by 1.2%. 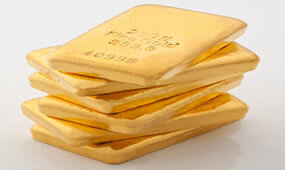 Gold declined $9.30, or 0.7%, to $1,343.85 an ounce. Silver slipped 6.5 cents, or 0.4%, to $17.335 an ounce. Last week in LBMA precious metals prices, palladium dropped 2.2% while the other metals advanced by 1.4% for gold, 2.1% for silver and 0.6% for platinum. United States Mint bullion sales moved ahead by 100,000 ounces in American Silver Eagles. Below is a sales breakdown of U.S. bullion products with columns listing the number of coins sold during varying periods.